In a quick resolution to the crisis, Burkina Faso's coup was over just a week after it started; the internationally-supported president was released from custody, and the coup leader stepped down apologetically after popular protests and mediation by neighboring countries. The AU Peace and Security Council, which is always in session, responded by lifting Burkina Faso's suspension on September 26. After Burkina Faso's return to active membership, there is only one remaining suspended AU member: the Central African Republic (CAR). The CAR was suspended in March 2013 after a rebel takeover, followed by the installation of a weak compromise government. Planned elections probably would have gotten the CAR reinstated to the AU later this month, but they've been delayed after a new outbreak of violence. Compared to the neighboring European Union (EU), the AU is only a loose forum for cooperation between its member countries. AU members do not have an integrated economic system, union-wide laws, or shared foreign policy, though further integration is a possibility for the future. 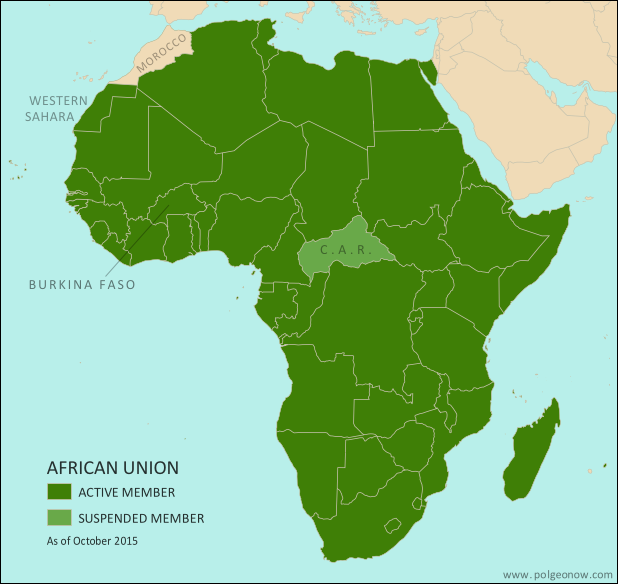 The African Union includes every UN-recognized country in Africa except for Morocco. Morocco withdrew from the OAU in 1984, after the organization chose to admit the Sahrawi Arab Democratic Republic (SADR), a disputed country that claims ownership of the mostly Moroccan-controlled Western Sahara territory. The only other parts of Africa not represented in the AU are a few groups of offshore islands controlled by European countries, as well the small Spanish enclaves in North Africa. The breakaway Republic of Somaliland is not a member, but is considered by the AU to be part of member-state Somalia.